Police in Rio de Janeiro and Sao Paulo have killed more than 11,000 people in the past six years, many execution-style, according to a report released Tuesday by Human Rights Watch. Few of the officers have been charged in the extrajudicial killings, which are often labeled in police reports as the deaths of suspects who resisted arrest, the report said. The 122-page declaration echoes a 2008 United Nations' finding that police throughout Brazil were responsible for a "significant portion" of 48,000 slayings the year before. "Extrajudicial killing of criminal suspects is not the answer to violent crime," said Jose Miguel Vivanco, Americas director at Human Rights Watch. "The residents of Rio and Sao Paulo need more effective policing, not more violence from the police." Isabel Figueiredo, Brazil's coordinator-general of human rights and public safety, acknowledged that police violence is a widespread problem and "it concerns the federal government a great deal." Figueiredo said authorities have launched a series of initiatives to confront the problem, including training police to respect human rights and the appropriate use of force, in addition to the purchase of less-lethal weapons for state police forces. Security forces "have begun to understand that instead of solving the problem, confronting criminals with weapons leads to casualties on both sides," she said. Officials from the Rio and Sao Paulo police departments did not comment. 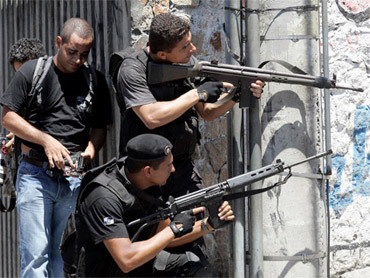 But Rio state Public Safety Director Jose Beltrame, in charge of the city's armed security forces, previously took issue with the 2008 U.N. report, saying critics don't recognize that his officers must constantly confront drug gangs who rule over slums and are armed with military rifles, grenades and anti-aircraft weapons. "We have to deal with something few others face: armed combat with drug traffickers who are equipped with heavy weapons coming from abroad," Beltrame said in an October interview with The Associated Press. "That is a unique attribute our police deal with." He spoke after Rio gangs had unleashed a wave of violence in which they downed a police helicopter, killing three of the six officers aboard - just a mile (two kilometers) from the Maracana stadium, where the 2016 Olympics' opening and closing ceremonies and the 2014 World Cup final will be held. The Human Rights Watch report examined 51 cases in Rio and Sao Paulo in which it seemed that police had killed an alleged criminal, but then reported the victim died while resisting arrest. In 33 cases, forensic evidence "was at odds with the official version of what took place" - including 17 cases in which autopsies indicated police shot the person at point-blank range, the report said, adding that "the 51 cases do not represent the totality of potential extrajudicial killings, but are indicative of a much broader problem." Using government statistics, the report noted that police have killed more than 11,000 people in Sao Paulo and Rio since 2003. In Rio, the killings reached a high of 1,330 in 2007. The report also states that Rio police killed one of every 23 people arrested, and Sao Paulo police one of every 348 in 2008. In comparison, police in the U.S. killed one of every 37,000 people arrested that year. The report recommends creating specialized units within state prosecutors' offices to investigate "resistance" killings and ensure that officers responsible for extrajudicial executions are brought to justice.